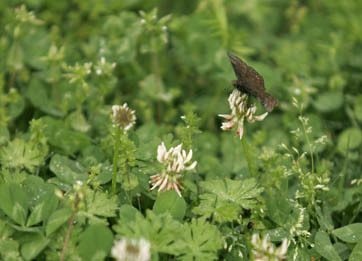 A butterfly rests on a flower at the Georgia State Botanical Garden on April 2, 2007. Students from Ecology 1000 catch butterflies once a semester as a lab assignment. 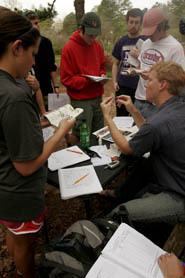 Jay Bush, a sophomore economics major from Athens, looks for butterflys April 2, 2007 as part of his Ecology 1000 lab. Section T.A. Justin Ellis, left, and student Kari Scott, right, mark one of the moths that were caught with whiteout so they could tell if they recaught it later. A butterfly spreads its wings on the shoe of an Ecology 1000 student. The students caught butterflys for approximately 30 minutes, marked the ones they caught, released them, and then tried to catch more to see if they caught any of the same ones. Section T.A. 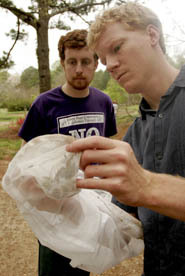 Justin Ellis, right, attempts to determine what type of butterfly freshman classical culture major Xan Holmes has caught at the Georgia Botanical Gardens April 2nd, 2007. Today my Ecology lab section went to catch butterflies, I figured I might be able to get some good photos so I brought my camera along. Justin Ellis, a T.A. for the ecology department spreads out the wings of a caught butterfly in his hands. The class, after catching the butterflies, had to identify them. Ellis often finds himself in hands on situations including holding invertebrates and jumping into the Tanyard Branch stream. Ecology 1000 T.A. Justin Ellis talks with his class about catch and release methods for observing butterflies as one of the caught specimin refuses to leave his arm after being released. Ellis had to force the butterfly off after a few minutes of it sitting on his arm and refusing to leave. Justin Ellis displays a caught butterfly that has just been tagged with whiteout so that students will be able to identify if he had been previously caught. Students of Justin Ellis’s Monday morning Ecology 1000 lab gather around as he identifies different species of butterflies. The 14 students spent nearly three hours at the Georgia State Botanical Gardens in Athens, Ga. for the assignment. Posted in Events, My LifeTagged athens, butterflies, butterfly, georgia, georgia botanical garden, university of georgiaBookmark the permalink.